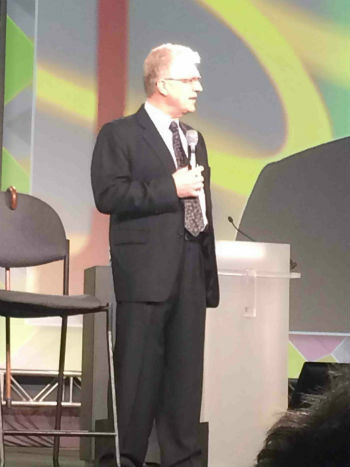 The Educause Annual Conference 2013 kicked off Wednesday as noted educationalist and author Sir Ken Robinson took the stage to challenge those in attendance to overcome the culture they’ve become accustomed to and welcome innovation. This was, of course, after Robinson, who delivered TED’s most-viewed talk of all time in 2006 and was knighted by Queen Elizabeth in 2003, had some fun with the packed exhibit hall. Robinson would continue to humor the audience for the duration of his speech, but his underlying message was serious: Innovation happens, whether the powers that be have prepared for it or not. When the TV was first introduced, he says, The New York Times ran a piece noting that it would never replace the radio in America because it required people to sit immobilized in a chair, whereas the radio still allowed them freedom to move about doing something else. Sitting stationary and staring straight forward, it turned out, ended up being the television’s appeal. TV, of course, went on to change culture. His point was that people appropriate brilliant ideas and see what they can do with them. These ideas have obvious parallels to current disruptive forces in education, like MOOCs. With Robinson’s keynote in mind, there are three questions higher ed professionals should be asking themselves. Would you like to see more education news like this in your inbox on a daily basis? Subscribe to our Education Dive email newsletter! You may also want to read Education Dive's interview with Blackboard about their MOOC plans.